Roughly 80% of B2B marketers utilize a content marketing strategy, and as an entrepreneur you know it should be a priority for your marketing efforts. But are any of them able to be scaled? Influencer outreach is not exactly scalable. Sure, you can do a few things to scale certain parts of it but it does take quite a bit of time to do it right. And when you use this approach you should definitely be involved with it as much as you can and minimize automated techniques. Paid promotion is nice – if you have the budget. It’s scalable to an extent provided you aren’t maxed out on budget and look at ways to improve your conversion rates. Email marketing is great if you have a list to promote it to. But it’s not something that typically scales quickly. Most of the time it is a gradual growth over a period of time. Typically, your email list will scale with your content marketing efforts. But when you are flying solo, or on a budget – how can you get more mileage out of your content marketing efforts? Of course the blog post title sort of gives it away – through social media. But how many times do you share it? Then you probably forget about it and move on to your next piece of content to create. You are stuck in an endless loop of only sharing your content one or two times and churning out new content. But what if there was a smarter way to promote your content on social media? There is. And today I am going to show you how. Here’s the deal. Chances are the content you create is evergreen – meaning that it will be just as relevant months or even years from now as it is today. The beauty of evergreen content is that when you create a stellar piece of content and are able to generate quality links to it in order to rank, the organic search results will drive traffic to your website month after month. Since the content is evergreen and still relevant at a later date, your website will deliver on what the user searched for. If your evergreen content is raking in organic traffic for you on an ongoing basis, why can’t the same happen with social media? Scheduling posts on social media is a commonly accepted approach for posting updates. There are tons of social media tools that can help with this. My choice for scheduling social media posts is Buffer. I can easily schedule posts for my social accounts and not have to worry about manually logging into my channels every few hours to post an update. You might be familiar with this approach and are wondering how can you can use this approach to scale your content marketing efforts? It’s definitely not scalable to plug away once a week and schedule social updates for your evergreen content. You certainly don’t want to manually schedule these posts again and again. Not only that, you will actually need to remember to schedule them each week. I don’t know about you, but I have tons of things vying for my attention everyday and I certainly have better things to do with my time. As an entrepreneur I am sure you do as well. So how can you scale and automate this process? Now that you know that you should be sharing your content multiple times on social media, let’s take a look at how you can automate the process. First and foremost, you will need to have a Buffer account. Ideally, you should be using their $10 a month awesome plan. You could use the free plan, but you won’t be able to post as much each month. Once you have a Buffer account (or if you already have one), you’ll need to create a Bulkly account. You will create your account with your Buffer login. Want to automate content marketing efforts with social media? Be the first to know when Bulkly is ready Click here to be notified. 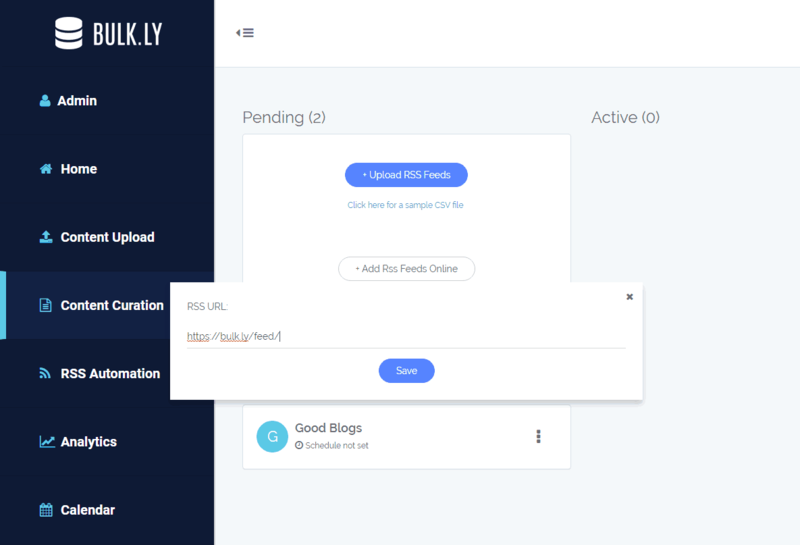 For those who are not familiar with Bulkly, it is a service that connects with your Buffer account in order to automatically add social media updates to your Buffer account. And if you have a WordPress site, it is drop-dead easy to import all your blog posts to Bulkly. Here’s how you can do it. You’ll first need to login into WordPress as an admin. Once logged in, you’ll need to click on the “Settings > Reading” tab in the left menu. Login to your Bulkly account and in your dashboard, click on the “Content Curation” button. Then click on “Add RSS Feeds Online”. Enter your feed URL, typically it is www.yoursite.com/feed if you are using WordPress. For example, for Bulkly it is www.bulk.ly/feed. Then name your group and save your settings. The following screen will load with your group showing all the posts Bulkly grabbed from your RSS feed. Be sure to go through your results, make any changes or delete the posts you don’t want sent to Buffer. At the top, be sure to select the Buffer queue of social media accounts you want the updates sent to and how often. You MUST check the “Recycle Posts” option so that Bulkly will continuously send items from this group to your accounts at the intervals you select. Also, you might want to enable the “Shuffle Posts” option so that these updates are random and not sent in order to Buffer. Be sure to set the schedule of how often you want these posts dripped to Buffer. Click the “Activate” button to save your settings and the posts will be added to your “Activated” queue in Bulkly. 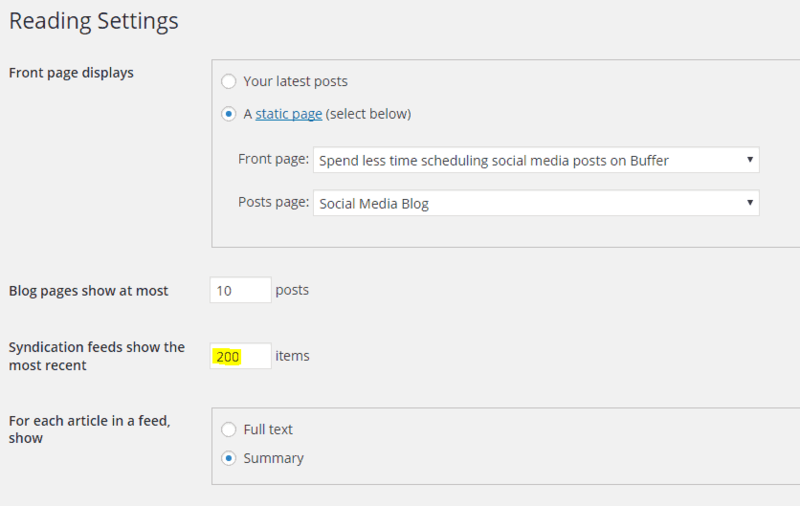 Depending on the frequency of posts selected, you should start to see one item from this group added to your Buffer account within a few hours. Moving forward, you should see one item added based on your settings. For example, if you selected 6 times daily, then a new item should be added to your Buffer account roughly every 4 hours. Once you have successfully imported your old blog posts to Bulkly, be sure to go back into your WordPress settings and change the amount of items shown in your feed back to the number it was before. Bulkly will have all your old content added and automatically send add it to Buffer without you having to do anything else. Your old content will be shared again and again. FOREVER. I get it, not everyone uses WordPress. Even with a non-Wordpress based site you can still pull all your content into Bulkly. Now, depending on your CMS, you might have a similar setting to adjust the number of items that are displayed in your feeds. If so, max out that number and follow the same steps as the WordPress based site instructions. If you don’t have the ability to change the number of items in your RSS feed, then you might have to get creative. One such way is by using your “sitemap.xml” file, which most sites have. However, for Bulkly it can be found at https://bulk.ly/sitemap.xml and within there I would need to navigate to the sitemap for my blog posts (https://bulk.ly/post-sitemap.xml). Again, yours will probably be something different depending on the CMS. The goal is to find the sitemap that contains links to your blog posts. Once you know that, you can use Google Sheets to help you grab all the page titles…because I’m pretty sure you don’t want to manually visit each page to copy and paste blog post titles to use for social media updates. You’ll now have a list of your blog post titles and corresponding URL. Now, you might be wondering why you have an empty Column A? Well in order to bring this data into Bulkly, we are going to utilize the “Text Upload” option which allows for a spreadsheet (CSV) to be imported. The format of the spreadsheet needs to have a group name in Column A (groups make it easy for you to organize your social media updates). For the purpose of this, just name it “Evergreen Blog Posts” and copy it all the way down to the last URL. The last thing you need to do is insert a row at the very top. Bulkly uses Row 1 for column headers (labels), but it’s ok if you leave them empty. So now, you have Columns A-C filled with data. Next, you will need to export this data as a CSV file. To do this in Google Sheets, click on “File > Download As > Comma Separated Values”. This should start an automatic download of the file. The next step is to upload your CSV file to Bulkly which will import all your content as social media updates. Instead of using the “Content Curation” function as mentioned for WordPress sites, we are going to use the “Content Upload” feature. To do this, make sure your Bulky account has been created and then proceed to your dashboard. From here, click on the “Content Upload” option and then click on the “Upload Content (CSV)” button. 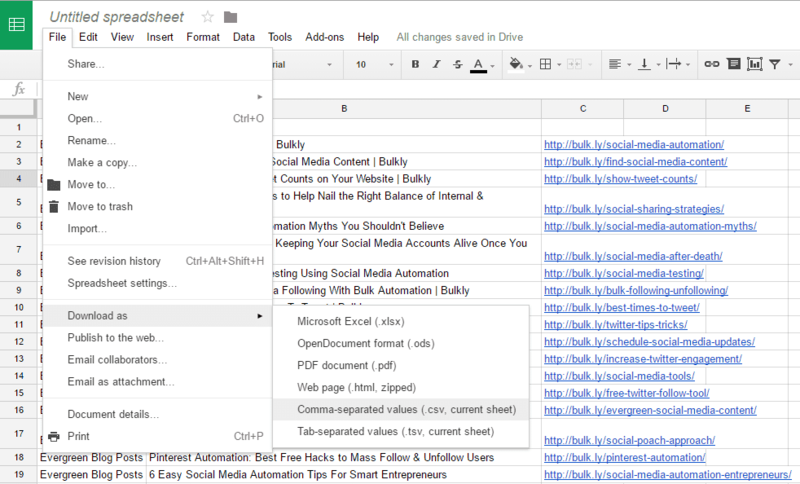 Then browse for the CSV file you exported from Google Sheets. Bulky will automatically, import the content from the file and you’ll be directed to the “Pending” page for this group. From here you will be able to edit, change, or delete any item and when you are ready, scroll down to the section under your imported posts. Here you can select what social channels and how often Bulkly should send content to your Buffer queue for the selected accounts. It’s very important to enable the “Recycle Posts” option as this will have Bulkly continuously send content to Buffer at your set intervals. Once you have configured your settings, click the “Activate” button and within a few hours you should start to see content added to your Buffer queue. One of the cool things about Bulkly is that you can configure it to add images natively to social media channels that accept them. A good example is Twitter. See how easy it is to scale your content promotion on social media? It takes just a few minutes to get setup, then it works for you automatically going forward. So you’ll free up time to work on more of the things from your never-ending to-do list. You’ll just need to be sure to periodically add in the newer content you created to Bulkly so it can be in the mix of updates sent to Buffer. And in the end, your social profiles will help you get even more out of your content marketing efforts. Have you wanted to scale your content marketing efforts with social media? While Bulkly is not publicly available at the moment, it’s just about ready. So be sure to sign up to get notified when it is live.